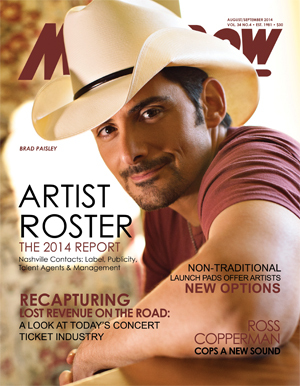 Brad Paisley is featured on the cover of the 2014-2015 Artist Roster print magazine. He is a critically acclaimed singer, songwriter, guitarist and entertainer whose talents have earned him numerous awards, including three GRAMMYs, two American Music Awards, 14 Academy of Country Music Awards and 14 Country Music Association Awards, among many others. A proud member of the Grand Ole Opry since 2001, Paisley earned the first of his 22 No. 1 singles in 1999, writing or co-writing 19 of them. His latest single, “River Bank,” is from his upcoming album, Moonshine in the Trunk, to be released Aug. 25. Paisley is currently an expert on ABC’s new hit singing competition, Rising Star, airing Sunday nights at 9 p.m., ET, through Aug. 24. Paisley also made multiple contributions to the new Disney animated film Planes: Fire & Rescue, with a voice cameo as a pick-up truck named Bubba, as well as recording two songs for the soundtrack: “Runway Romance” and “All In,” which Paisley wrote and serves as the final song in the movie. Paisley is currently headlining his Country Nation World Tour presented by KRAFT Cheese all summer. Visit www.bradpaisley.com for more information. To receive your copy of the Artist Roster subscribe now. For information on purchasing individual copies of MusicRow magazine, click here.